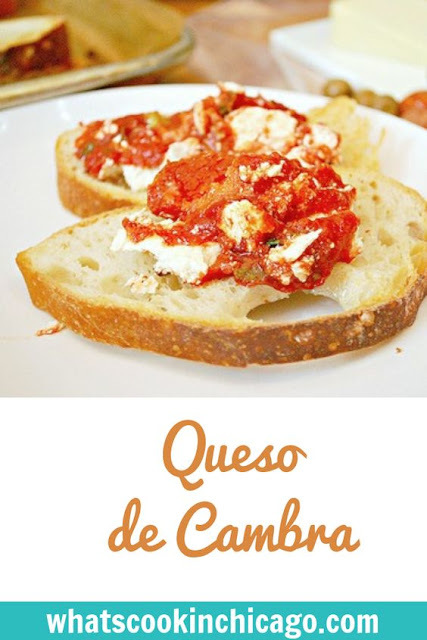 This is one tapas I think everyone can make easily at home. It only requires bread, goat cheese, tomato sauce and basil. The recipe below adds some minced garlic and olive oil to the bread for additional flavor but it really isn't necessary. 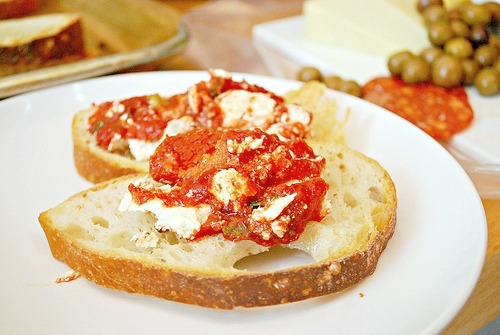 For the goat cheese, feel free to substitute with a flavored version that would pair well with tomato sauce. And speaking of the tomato sauce, a can of crushed tomatoes or even your favorite marinara or pasta sauce would work too. I wouldn't use dried basil for the fresh because the flavor just doesn't come through as well with dried basil. To serve, toast some sliced French bread [or gluten free hot dog buns] brushed with olive oil or butter. Preheat conventional oven or toaster oven to 350°F. Mix together garlic and olive oil and spread over bread slices and place on a baking sheet. Pat goat cheese into a 1/2-inch pancake and place in shallow baking dish. Ladle tomato sauce into dish to come up to top edge of cheese (do not cover the cheese with sauce). Bake, uncovered, until sauce begins to bubble at edges and cheese is hot, about 25 minutes. During last 10 minutes of baking, toast bread until golden brown. Garnish cheese with basil if using. Mmmm, you had me at goat cheese! It's so easy, yet it looks absolutely delicious!! I love it! This looks like a winner, for sure! Yummy! That looks so good and love that it is easy to make! That looks so yummy, and easy enough that even I could do it without messing it up! Great recipe and simple too. So down my alley!! Oh how I wish I could open my screen and take the food out!! Yummy!! This looks so tasty!! Yum,I just love cheese! Thanks for sharing the recipe! Ohh this sounds right up my street I do love cheese! Which tapas place did you go to? 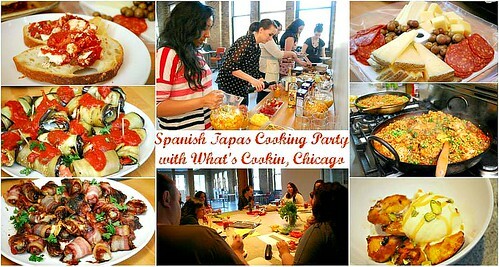 My favorite tapas restaurant in Chicago was closed the last time I tried to go... it was SO sad!! !